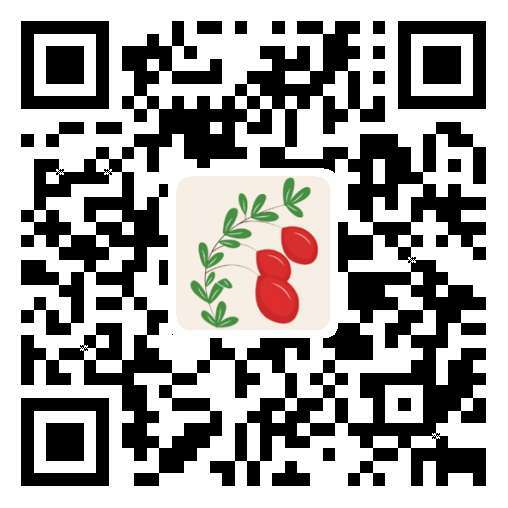 From September 18 to November 30, 2016, a cranberry recipe online promotion was conducted with Xiachufang.com, an online recipe sharing community. The promotion aimed at increasing awareness of U.S. cranberries and inducing wider usage among the consumers. 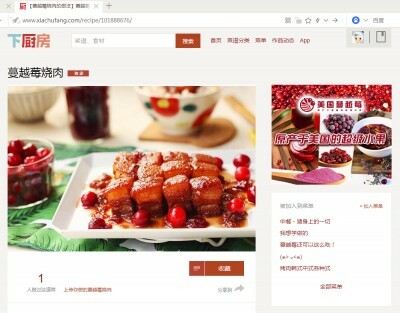 At the start of the promotion, Xiachufang.com invited 4 key famous food bloggers to develop 8 cranberry recipes using frozen cranberries, dried cranberries and cranberry juice. The recipes were: Slow Roast Beef Shoulder with Cranberry and Mashed Potato, Braised Pork with Cranberry Sauce, Cranberry Egg Yolk Bun, Quinoa Salad with Cranberries and Walnuts, Cranberry Butter Scone, Cranberry Cheese Cake, Cranberry Jelly Sparkling Water, and Cranberry Margaritas. These recipes were posted onto the Xiachufeng.com web-site along with other kinds of recipes uploaded by members of this online community. The cranberry recipes received a total of 609,258 impressions and 10,893 likes. On two separate weeks, Braised Pork with Cranberry Sauce and Quinoa Salad with Cranberries and Walnuts ranked as second most popular among all the recipes posted onto the community during these weeks. The menu list with these 8 recipes was also found to be the second most popular menu list for five of the weeks. It received a total of 4.43 million impressions and 37,635 clicks. 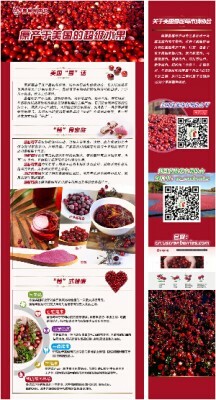 To generate more awareness, one banner with a cranberry image was inserted into the Xiachufang.com website and another one on the online community’s mobile APP, both for 22 day. These banners were linked to the CMC landing page. The banners received a total of 7.25 million impressions and 7,707 clicks. To stimulate its community members’ involvement, Xiachufang.com conducted three rounds of promotions. 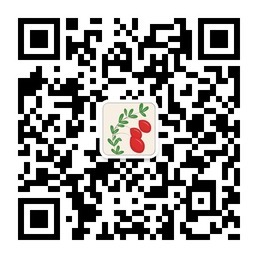 Educational information on cranberries was posted on its Wechat. Members who posted their comments on such information via Wechat were presented gifts of dried cranberries, cranberry juice, and 2017 cranberry calendars. The 3 postings received 23,531 clicks in total and 985 members participated in the promotions. 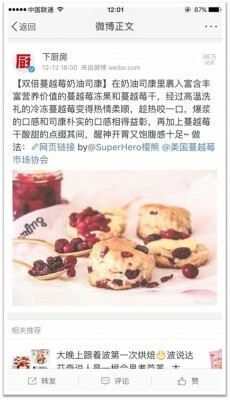 Additionally, Xiachufang.com posted on a recipe for Cranberry Butter Scone on its Weibo account. It received 360,000 impressions. Founded in 2011, Xiachufang.com is a recipe sharing community with user-generate contents. It features over 645 thousand recipes and 23.6 million food shots. It claims to receive 85 million page visits per month, while the mobile APP is reported to have 40 million users. Xiachufang.com also has 500 thousand Wechat followers and 3.57 million Weibo followers.